Sales at ABS Plastic Lockers Manufacturer Co., Ltd.
ABS Plastic Lockers Manufacturer Co., Ltd. is a professional manufacturer of ABS Plastic locker, matched lock and some accessories. Our team is working closely with you to tailor a solution to your needs. 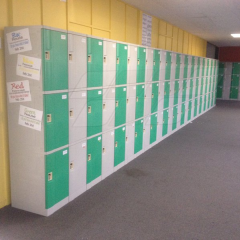 We specialize in providing high-quality ABS plastic storage lockers for school, office, supermarket, hotel, beach, gym, stadium, hospital, entertainment places and other suitable occasions.